Creating opportunities for emerging artists and a platform to develop supportive networks through process, dialogue and exchange. On a chilly November day in 2012 Hand in Glove brought 150 people together in a warehouse in Bristol to share and exchange artist-led practice at INTERPLAY. In June 2013 we continued these conversations in the beautiful and sun-drenched Somerset countryside with sixteen people, travelling from as far as Manchester, Plymouth, Newcastle and the neighbouring farm. 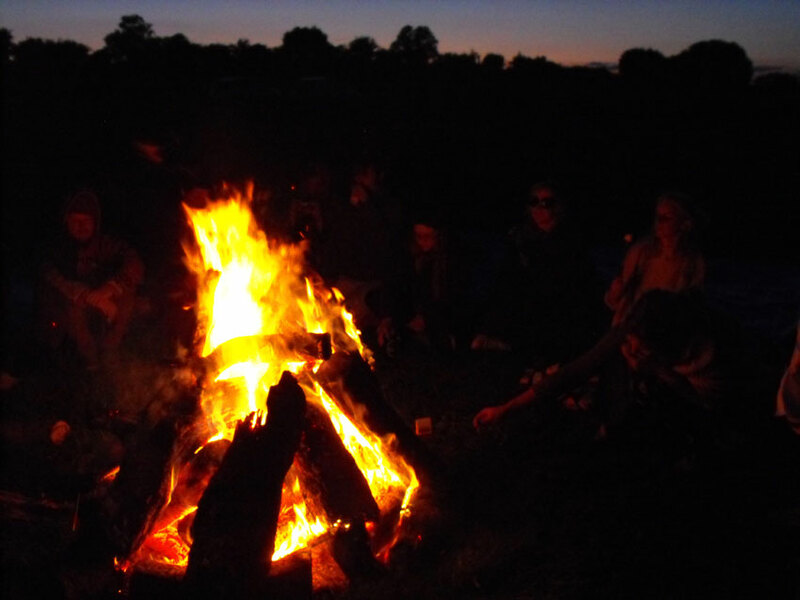 The artists and producers that came were expecting to meet new people, be creative, swap experiences and toast marshmallows around a campfire. But beyond all these high-jinks there was serious business to be done. This was TENTERPLAY and this was a survival camp. Every experienced scout knows that to survive you should always be prepared, so to aid with the rest of the weekend a TENTERPLAY survival kit had to be constructed, with input from each aspiring survivor. The kit was agreed and pegged on some string and surprisingly on schedule, the group trooped on to session two with a fresh lathering of sun cream. Traditionally, any scout in the wilderness should first construct their shelter for the night. At TENTERPLAY however we were one step ahead of the game; the marquee had been erected the day before. Time and energy could be better spent considering whether artist-led activity should happen within the confines of a fixed space or whether the great outdoors could be a more appealing prospect, at a time when budgets are stripped to the bare bones. Four project ideas were planned with minimal budgets: a site-specific writing commission and performance, a pop up day of live art in a town centre, a studio community skills exchange and a carry-able stage commission for multi-venue festivals. To sustain oneself in the wild a scout must seek nutrition and hydration. Each group was given a jacket potato and the plans laid down by another group. Fully fuelled, all participants pushed on to flesh out the plans. There were questions about timescales, commissioning processes and marketing strategies but there were also questions about who had brought the biggest marshmallows and a bottle opener. Paracetamol administered to casualties from the night before, day two eventually crawled out of its sleeping bag with an armful of triangle bandages ready for session four. Suggestions of crowd-sourcing, merchandising, sponsorship and unusual sources of in-kind support were all thrown into the collective pot for commissions, catalogues, community projects and more. Even artist fees and core costs weren’t left to get lost in the woods, though there was resounding agreement that these are worryingly difficult to find. Scouts used to urban environments should be aware that out in the countryside transport links are fewer and far between. Tents evaporated in the continuing heat and rucksacks were packed up to catch trains going both north and south. And now that we’ve left Castle Cary, how do we use TENTERPLAY to inform our future working? 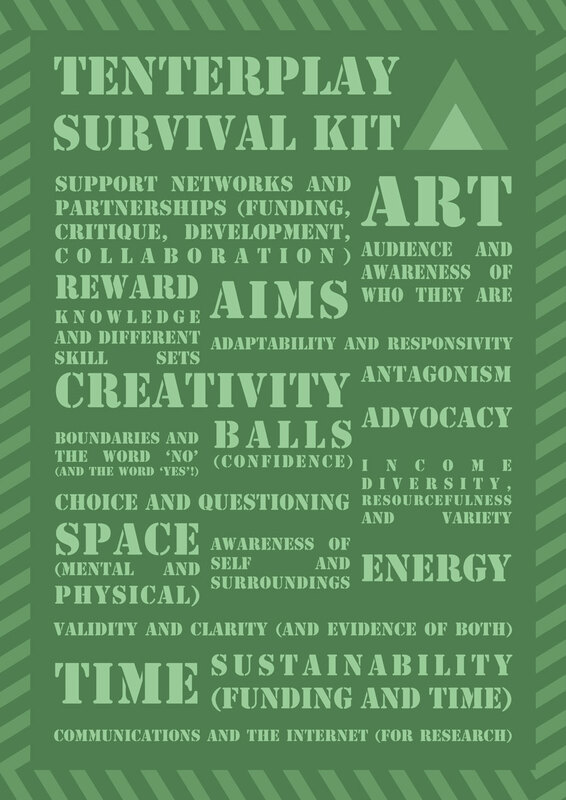 Can this exercise impact on the ever-increasing struggle for survival in artist-led practice? Which conversations will keep growing between those that attended TENTERPLAY? How would it have been different if more/a wider range of artists and artist-led projects had come? Do artists value free events at the same level as unsubsidised CPD? Should Hand in Glove continue this line of enquiry? Throughout TENTERPLAY Nom de Strip documented the participants as they took part in the survival sessions. Following on from the event all of the participants have been asked to write a postcard to their fellow campers. These postcards will be posted by mail and collated online to be seen by visitors to the Hand in Glove website.